Home > Men's Vintage Shirts > Hawaiian Shirts > (XL) Vintage Mens Short Sleeved Shirt! 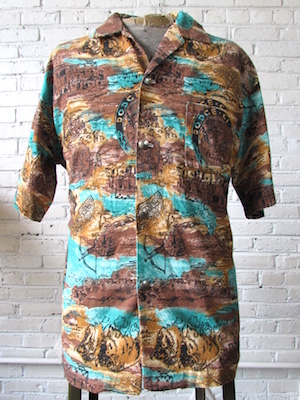 Brown & Turquoise Dodge City Desert Print! Vintage men�s 70s short sleeved shirt! 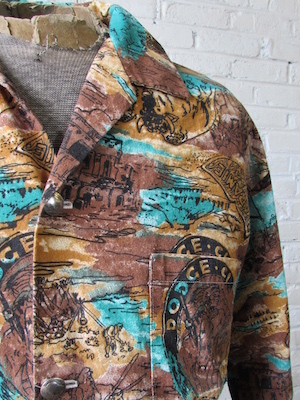 This super cool Dodge City shirt has a base with patches of various shades of brown with punches of turquoise. On top of the patches of color are images printed in black of Native Americans, buffalo,horses, teepees and other images associated with Dodge city and the west. The shirt appears to be homemade and done in the style of a Hawaiian shirt. Closes in the front with faux silver colored buffalo nickel buttons. Has one chest pocket on the left side. Shirt has two small side vents and a straight hem. No Material Tag but feels like cotton or a cotton blend..